Vintage blue dress is adorable! I just had to show you this great dress I found! 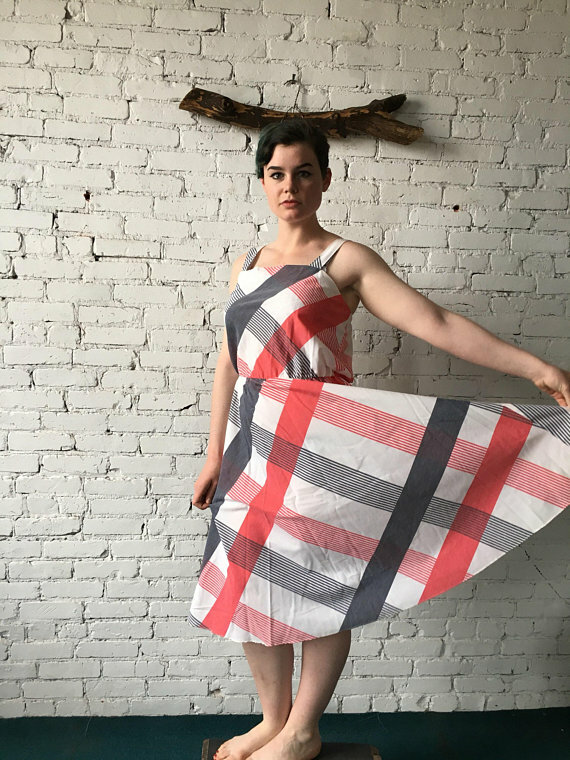 I was actually looking for summer dresses – and this one could be worn in summer – but honestly you could wear it year-round, which is even better. But really, the best part of this dress is that it’s a bit unusual, it’s lovely, it’s affordable, and did I mention it’s so cute? I mean come on, that matters! It’s available at Kitten Surprise Vintage at Etsy, and the owner/curator Marjorie really knows how to find vintage goodies! Not to mention, her prices are good-to-terrific, and she includes clear pics that show the details you need to make an informed online buying decision. Bottom line though – is she’s got great stuff – and this dress? Love it! 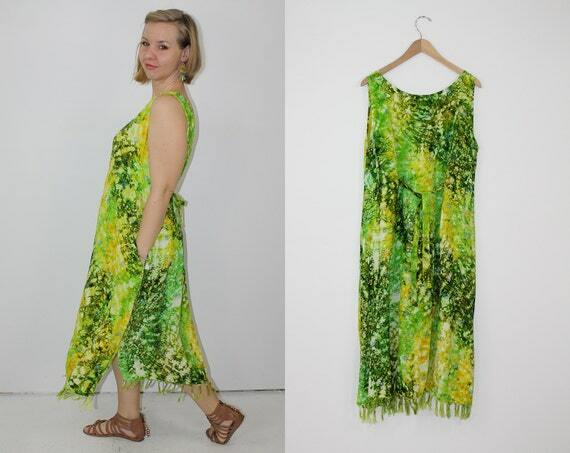 Vintage Hawaiian print maxi dress – great for summer! I saw this adorable dress at Dynamo Vintage on Etsy, and I am so glad I found this shop! Candice, the shop owner and curator, has a great eye for truly wearable vintage fashion. She gives good clear pics and detailed info – just what you need to make online purchases. On this dress for instance, she shows us the tag size (14! not size 2! Yay!) – but she also gives dimensions in inches, as well as fabric content, where it was made, what sort of closure it has (zipper). And her model pics show how I’d be wearing this. Add some sunglasses – okay, maybe some killer earrings or bangles – a pair of comfy sandals – and I’d take on the world. You could wear this dress anyiwhere – and look great. That’s what fashion does – when it works. 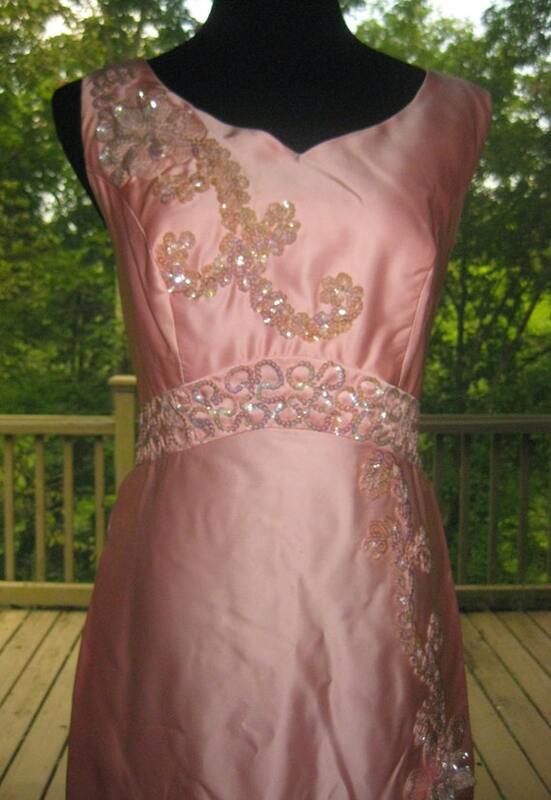 Vintage pink prom dress or bridesmaid dress – size 16 – on Sale! This is a fantastic dress, when you want something festive, formal, feminine – yet modest. Seriously, take a look! Yes, the dress needs to be pressed. So? It is SUCH a great deal (see below!) – and such a great dress – that having to iron it? Not even a problem. Look at that sequin detail, and the lovely neckline, and the flattering waist. And it’s a size 16 – not a size 2! Yes. Love! 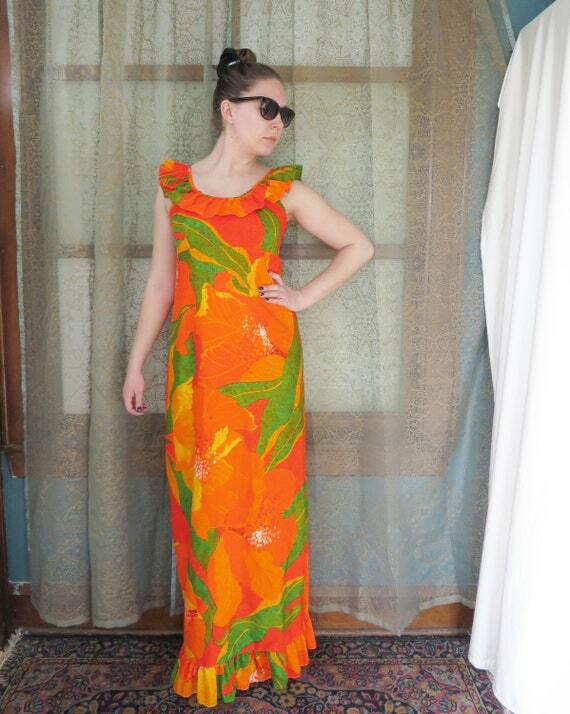 I found this wonderful dress over at Well Worn Wardrobe, a vintage boutique on Etsy. The shop owner, Lonita, has some terrific finds, clear pics, and she gives the detailed info you need to make an online purchase. And her current sale goodies – fabulous! 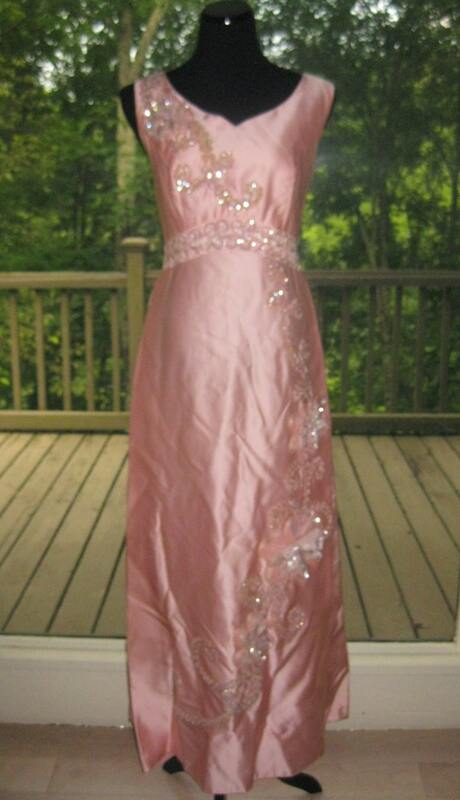 This prom dress, this lovely garment, is on sale for $14.97 plus shipping – I am not kidding! You really need to go visit her shop and find those special buys you’ve been looking for. You will totally thank me! Prom dress. Party dress. Bridesmaid dress. This dress WORKS. You know what I mean – you’re dressed, you look great, and it was easy. Also inexpensive! I found this darling dress at Sunshine Scene on Etsy. 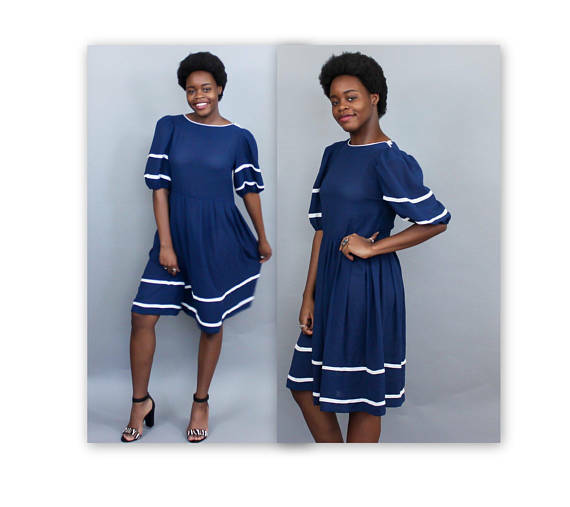 Darlene, the shop owner, has some wonderful summery dresses, and she’s going to be expanding her shop – you definitely want to check it out! And this dress, this lovely vintage dress? Costs $25 plus shipping! Pretty. Summer. Dresses. Great prices. You know you’re going to love it! And why do I love this shop, you’re asking? (Actually you already halfway know, because you are seeing these shoes.) Well! Her pics are clear and contain the info you need to shop wisely, her prices are fair, her reviews are terrific, and honestly, it’s just FUN to shop there! And. Those shoes. Really that’s all I need to say. I haven’t even mentioned yet, the tan leather boots she’s got that oh I wish were my size, and the adorable piggy bank, and the actual Givenchy dress that you just have to see! This is why vintage is so much fun. Now this is the best example in the world for why we love vintage. It’s snowing outside, it’s cold, it’s going to be Red Alert Winter for a while, you know? We want to be warm, and safe (non-skid boots!) – but we also want to look great. And we want our stuff to be special, and a little bit unique if possible, and fun. Fun is important. So! Look at these fabulous boots. Are those not wonderful? And they are only $35.00 plus shipping! Trust me, if they were my size, I would be showing you a different item, because these would be already sold. I found them at LesSoeursVintage, a wonderful vintage boutique on Etsy. You really and truly want to go shopping there. Even after Christmas. You deserve a little goodie for yourself. Like the vintage floor length black dress, or the vintage 1950s Bestform lace-up corset, I’m serious, you have to see it! Do you get the idea that this could become your favorite vintage shop? Yes. You’re welcome. 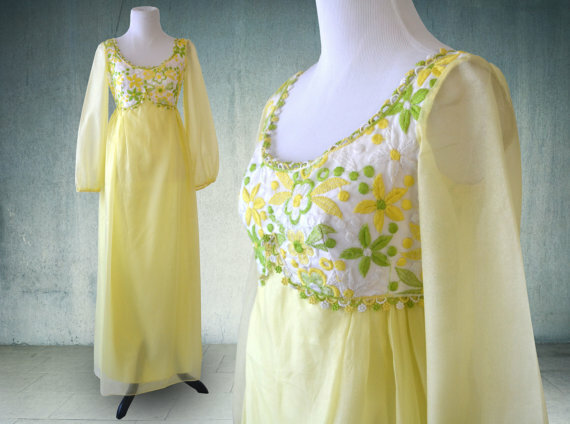 I found this darling dress while doing a search for “hippie dress”. Now I don’t really consider myself a hippie, or the dresses I love as ‘hippie’ – but comfortable, pretty, flowing dresses are labeled that way right now. So just go with it. This is now officially a ‘hippie dress’. I found it at Yellow Bee Vintage, a sweet vintage boutique on Etsy. Nicci, the shop owner, has a terrific eye for value – she has great items, she gives good pics, and includes the detailed info you need to make an online purchase. Not to mention, just as an example, an ivory organza 1950s wedding gown with ruched sleeves for $169.00, I am NOT kidding, and a pair of beaded white wedding gloves for $25.00. You need to check out this shop! Oh. Did I mention the lovely yellow festival dress is $38.00? Nice little detail there. Now seriously: go shopping. You’ll thank me! You were wondering why I love vintage? (Actually you probably weren’t, because you already know how wonderful vintage is). 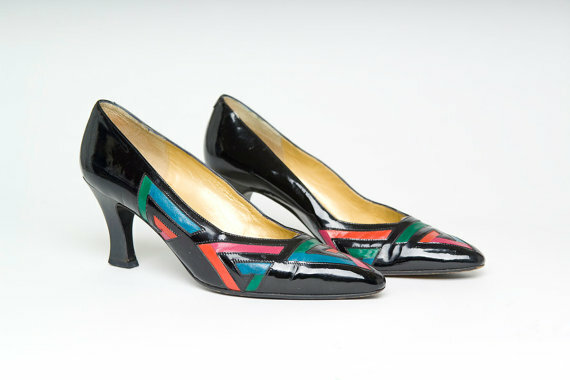 Well these gorgeous pumps give you one fabulous reason. Now that is a pair of shoes you can be proud to wear. They’re Caressa – I’ve worn that brand – I’ve paid FULL PRICE for that brand! And here they are, in great shape, wearable, beautiful, feminine, and unique. This is why we love vintage: Because we are special and unusual and our stuff should be too. Isn’t that simple? I found these lovelies at Rocky Mountain Retro , a vintage boutique on Etsy. Lin, the shop owner, has a great eye – and she’s smart enough to give clear pics, including potential issues, so you have the accurate info you need to buy online. It doesn’t hurt that her prices are attractive, too!